The Neopian Auction House is one of the three main places to buy items, with the other two main places being the Trading Post and the Shop Wizard . 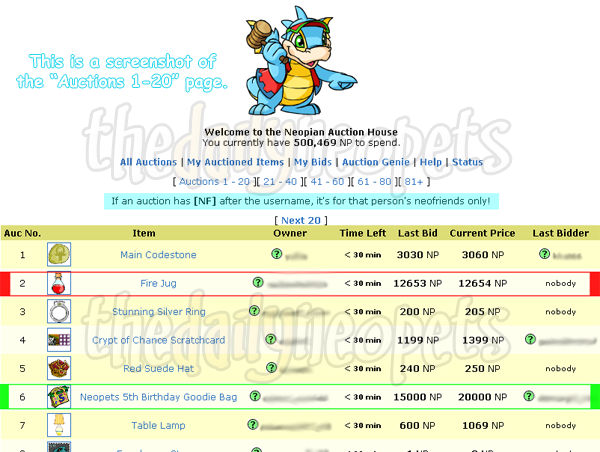 It works very similarly to a real-life auction, and it also has some relevance to restocking (on Neopets). It's a very good way to make money, and it's quite simple once you know how to do it and you have had practice. Below the auctioneer is a set of links to navigate around the auction house. You're currently on the "All Auctions" main page, also known as the "Auctions 1-20" page. Listed on this page are auctions that are about to end (like literally in a minute or two). The higher the auctions are on the list, the shorter their time left is. These are the auctions that are best to bid on. The next two links, My Auctioned Items and My Bids, are self-explanatory. They list your auctioned items and the auctions you've bid on, respectively. The Auction Genie functions almost exactly like the Shop Wizard. Checking the box ignores Neofriend-Only auctions. 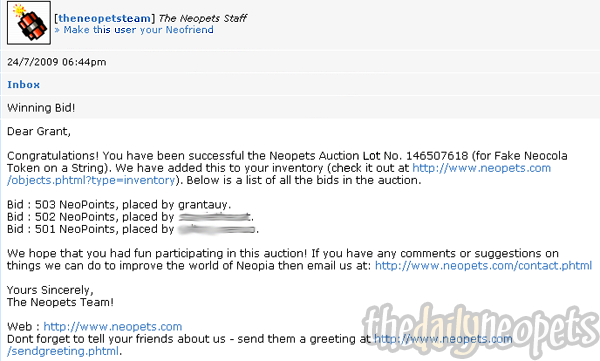 NOTE: In NF-only auctions, only Neofriends of the item's owner can bid on the item. These are noted by "NF" next to the owner's name. The last two links are Help and Status. Help is self-explanatory, and Status shows how quickly the auctions are being processed. The next row of links (the ones with the numbers) are for viewing other auctions that are further away from ending. The lower the number, the less time is left. Bidding is simple. 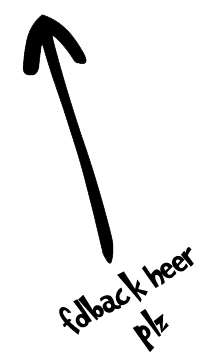 Simply type your bid into the box and click "Place Bid". The lowest allowed bid is already in the box, so if you don't want to bid extra neopoints, go ahead and just click Place Bid without typing anything in. Each auction has its own minimum increment value chosen (by the item's owner) at the start of the auction. The lowest bid you can make is simply the last bid plus the minimum increment. For instance, if the minimum increment is 5 neopoints, and the last bid was 40 neopoints, then the lowest bid you can make is 45 neopoints. The minimum increment is listed on each auction's individual page above the item image (and below the lot number). As soon as you bid, the neopoints are deducted from the amount you have on hand. However, if you bid twice on the same auction, it will only deduct the extra neopoints you bid for the second time. 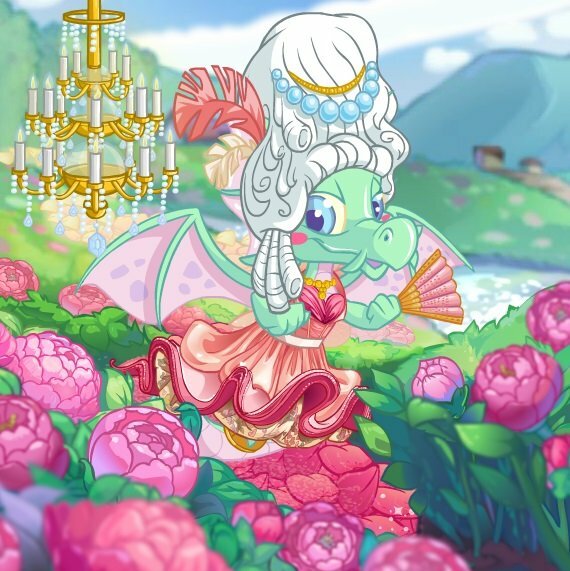 For instance, if you bid 100 neopoints on an item (and deduct 100 neopoints from your account), and then you bid 150 neopoints later in the auction, only 50 more neopoints will be deducted. Also, if you do not win the auction, you will get your neopoints back shortly after the auction has ended. You cannot withdraw bids. Simply bid for anything that has an auction price lower than its actual price. That's a given, but that's really the only thing you have to look for. However, it's good to go for items that are easy to sell, such as dubloons, codestones, and paint brushes. Familiarize yourself with the prices of each codestone along with the prices of the low-denomination dubloon coins so that you don't waste valuable time using the Shop Wizard. Going back to the first screenie near the top of this page, an example of an item that you should bid for is in a green box. The item in the red box is an example of an item you should NOT bid for. Once the auction has ended, it says "This auction is closed, you cannot place any more bids!" instead of the Place Bid button and the box to input your bid. If you had the last bid in the auction, you win it! A few minutes later (usually about 2 to 10 minutes), the item will appear in your inventory, and you will get a confirmation neomail like the one below. To auction an item, all you have to do is click on the item in your inventory. Then select "Auction item" from the dropdown and click "Submit". To sell an item at a predetermined price (such as to return an ALP lend or at a price agreed upon by both buyer and seller), have the start price and the minimum increment bid add up to the agreed upon price. 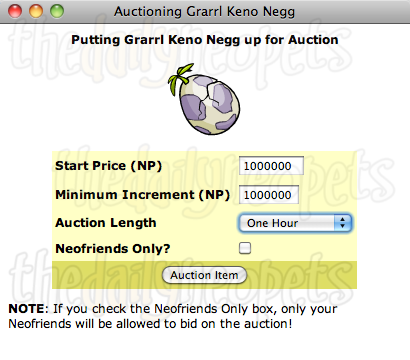 If say, this Grarrl Keno Negg had an agreed upon price of 2,000,000 (2 million) neopoints, then set both the starting price and the minimum increment to 1,000,000 (1 million) neopoints so that when the buyer bids, it is the agreed upon price. The minimum increment is added to the starting price when the first person bids. This is important to remember when setting up an auction for a specific price. Also, setting a high minimum increment decreases the chances of someone else bidding on the item. Say you have a Double Agent Zafara Plushie that you are returning. If the minimum increment is only 1 neopoint, with a starting price of 6,999,999 neopoints, chances are someone else will bid. However, if the starting price is 1 million neopoints with a minimum increment of 6 million, chances are no one will spend 13 million neopoints on it.